The first thing that grabs the reader is that the whole book looks like a movie. 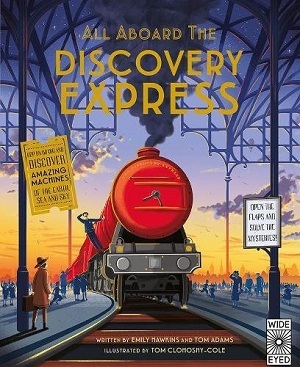 From the first page, a night-time scene of a train on a platform, which introduces the characters who steer the reader through the book, to the final farewell: an air shot of a plane flying above a train on a bridge, a landscape of sailing boats on rivers, and vast plains spread out below. 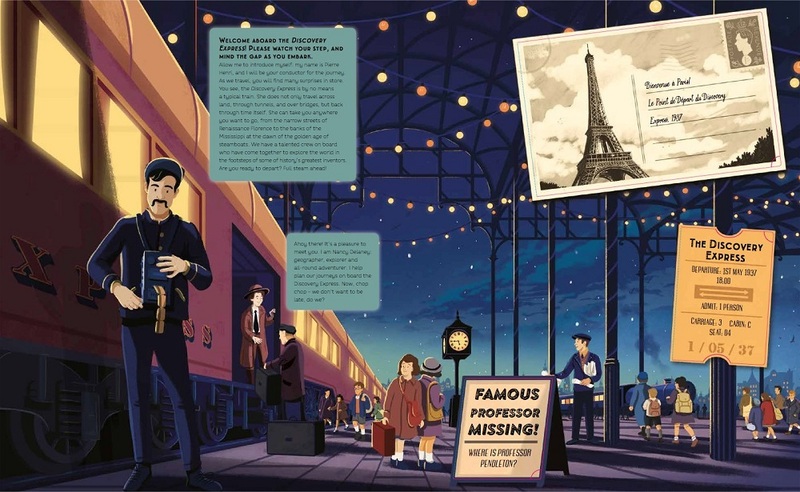 For this is no ordinary fact book about transport – this combines superior graphics, a mystery to solve, and time travel, all wrapped up in an information book that imparts knowledge on transport firsts, transport inventors, the mechanics of pedals, the Panama Canal, steam trains, steam boats, motorcars, hot air balloons and much more. On the first page, the reader is invited to board the train, but also learns that the expedition’s leader has mysteriously vanished. The idea is to solve the mystery of his disappearance whilst learning about the history of vehicles. Each spread depicts a different visually cinematic scene, with paragraphs to explain concepts and to further the mystery, as well as information illuminating the science behind the concept in small text or diagrams underneath flaps, which lift to give an extra dimension to the main scene. There are also clues to solve, such as riddles and codes. The first page introduces the invention of the wheel, by diagrams as well as text, and a rhyme to solve. There are tips given in tiny print, upside down, to help the reader. A map illuminates first vehicles around the world. What’s clever is that the reader becomes immersed in the scene depicted, which looks just very visual, but behind the flaps is an enormous amount of information (but all in bitesize chunks). The overall effect is one of great excitement, as the momentum builds to show how humans have wanted to travel faster and further over time. The book incorporates engineering within the excitement of the transport race, and, as with the best books, communicates knowledge without it once feeling like a chore to learn. The execution is great, but the illustrations are stunning. Timeless, with a light effect that highlights the mysterious nature of the journey, whilst allowing cracks of realism through – the shadows cast by the vehicles themselves, the light from the coal fire on the steam train, the reflections on the window of the submarine. The only (minor) flaw is the size of the print. In order to fit so much information behind the tabs, some of the typeface is really quite tiny, which makes it difficult to read. However, if the reader is willing to see this as one of the challenges to overcome in solving a mystery, then they’ll be richly rewarded by the end result. Overall, a triumph. Quality information and simply mesmerising to look at. Come aboard here.